Last summer a huge storm came out of nowhere and hit our area. They call it the Derecho. I don't know why that call it this but they do (I believe derecho is Spanish for the direction right--CORRECTION. Thanks to Andrew Miller I stand corrected: "Derecho is a term used to mean a hard, straight wind..."). Anyway, when this storm hit our area the winds were so extreme that one of our mighty oak trees fell down...right on top of our carport. Yes, our minivan, Clyde, was in it. Thankfully and miraculously Clyde survived with only a few scratches. The carport, however, was not so lucky. It was totally demolished. I finished taking it down in the ensuing weeks while simultaneously cleaning up the tree. My parents came to visit us in October of last year and with my dad's help we rebuilt the carport and made it better than ever. From the rubble of the original carport I salvaged some lumber. It has been sitting around on the side of our yard for the last year now and about a month ago I decided I was going to give it new life. I hereby declare that from the ashes of our carport will rise a tree fort! This tree house is going to be awesome. I've already decided that it will be built in three phases with construction on the first to begin this summer. The other phases will come as we have the money, time, and the children have the ability to appreciate each phase in its resplendent grandeur. Before I began building I spent some time researching techniques for building tree houses, best-practices to keep from damaging the trees, cool features to include in the tree house, etc. One suggestion I read several times was to get your kids involved in the planning and make it more of a family project. I figured it was good advice so two weeks ago on a Sunday afternoon I sat our three boys down at the dining room table and asked them "what do you want in the tree house?" What harm could come from asking, right? 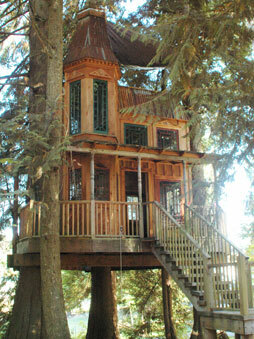 They're still little and they haven't seen any other tree houses; they won't ask for anything too crazy. Wrong. Here's the list that they came up with in about ten minutes. Seriously, they said these things without any prompting from me or Cami. It's quite the list so be prepared. My oldest, he's five, added that last one. When asked what I would make them out of he replied "metal, like the ones at the zoo." Problem solved. Here's my list of things I would like in the tree house. Before I asked them for input I thought that I was pushing the boundaries of the possible. I realized after my brainstorming session with my boys that I am just simply not creative enough. What suggestions do you have for things that we should include in our tree house?